all in applied shining gilt metal sheet . (Löffler-Kirchner) with library number 3973 on label at the lower back. – Partially faintly foxing, only occasionally slightly spoilingly more, among which title and the portrait printed by J. Niederbüll in Stuttgart. 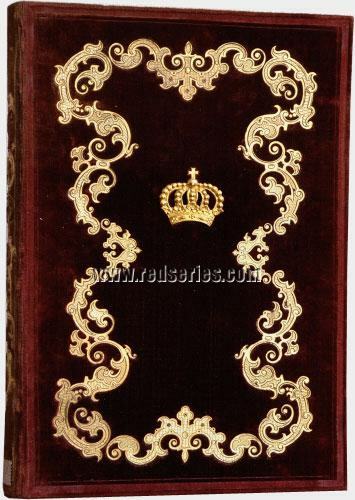 The extravagant binding rubbed conditioned on the velvet and the back paled. Gilt edges as the metal sheet embossing and particularly the raised ducal crown of unbroken radiation. I saw at the antiquary yesterday is gone ”.